Vermont Turkey Season 2017 - Hunt 1 - the4pointer.com | Real Hunts. Unreal Stories. I hold a certain affection for hunting turkeys much the same as I do for woodchucks. They drive me nuts, and I finally figured out why. It’s the way they look at you. A deer, for instance, will stare right at you if they sense danger, which is a logical approach. A turkey or a woodchuck will appear as though they are looking perpendicular to you, but in actuality, they are giving you the business out of one beady little eyeball mounted on the side of their head. I’m not sure why it annoys me the way it does, but their stupid little eye games make me want to bring them home for dinner. 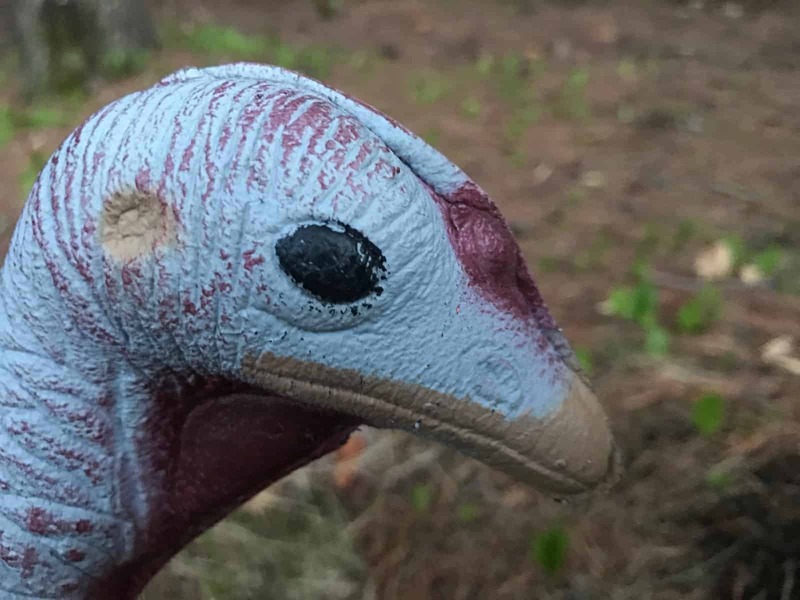 What really annoys me is that I perceive turkeys to be a dumb bird because of the way they look at you and that they can’t tell the difference between a foam decoy and the real thing, but I haven’t been able to get close enough to kill one in the spring yet. I’ve killed three in the fall, and I’m proud of those accomplishments, but they feel different. I was hunting deer and ended up doing a little spot and stalk turkey hunt. Shooting them with a .270 is a lot easier than getting within range of my new Benelli, I have found. Just kidding, I shot them with my bow. I haven’t done any scouting for turkeys, so my plan on Tuesday was to simply enjoy the morning at some of my old killing grounds and hope to find a bird that wanted to play. Much to my surprise, I did! In the end, he was more of a conversationalist than a take action type bird, but it was still fun to chat with him. He answered my horrible calling while still perched on his roost. I first heard him when I was about 300 yards away. The faint sound of a gobble in the predawn darkness really gets the adrenaline pumping. I hightailed it up the ridge in his direction and promptly set up in the wrong spot. It took me a while to realize that, but when I did, I repositioned further up the ridge above his location. He’d quieted down since his controlled crash out of the roost, but he became chatty again once I set up above him. Maybe there is a lesson to be learned in that, or maybe not. I don’t know, it was only my third time ever hunting these birds in the spring. I’m sure I’ll become a better turkey hunter the more I go. Another gobbler eventually joined in the conversation but the birds would not reveal themselves to me. I could see about 100 yards down the hill, but they were just over the edge of a drop-off into a ravine. I’d call, they’d gobble back. I’d call again, they’d gobble back again. It was at this point that I thought it would have been smart to bring my hen decoy, Shells. Perhaps her pretty little foam body swiveling on a stick at the crest of the hill where I was located would have been enough to draw one of the bearded fellas up to me. I left her in the truck because it was raining and didn’t want to carry armloads of stuff three-quarters of a mile up the hill. I Should’ve brought her. The boys finally revealed themselves a few minutes after two hens broke from the group and left them behind. Through the trees and at approximately eighty yards, it appeared that there may have been three to four bearded fellas. A few of them would fan out occasionally, but none would commit. Eventually, they walked back into the ravine and out of my life forever. It was fun to call and hear them respond. I kept quiet for a while, hoping their curiosity would get to them and they’d come investigate, but that didn’t work either. I’m guessing they were with some hens and my calling wasn’t enticing enough to draw them away from the ladies they were in a committed relationship with. I need to find a bird with loose morals. Once back at the truck, I opened the door and reached for my coffee in the cup holder only to see Shells sitting where I’d left her in the back seat. Sensing danger, she appeared to look straight ahead, but I knew her beady eye was focused right on me. Fooled she was, for instead of grabbing my coffee I swatted her in the face out of spite. This turkey hunting is addicting! Pretty sure there is a BMP for humane treatment of foam decoys. Doh! I had no idea.